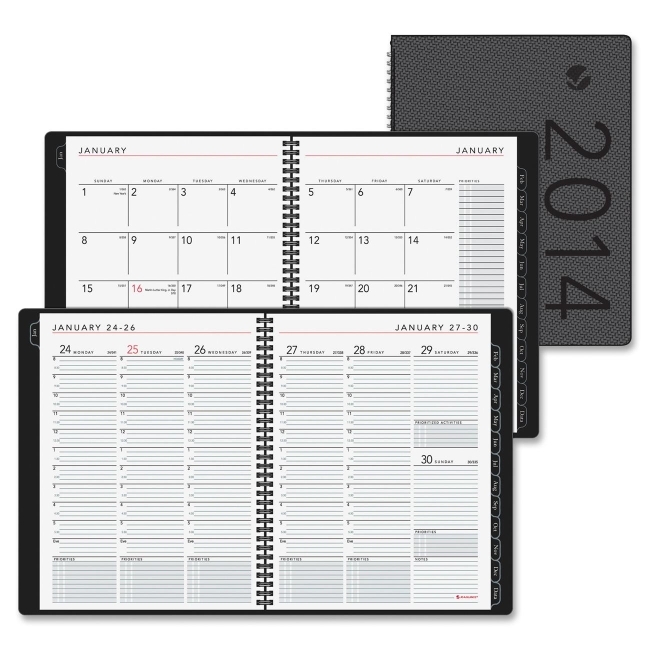 Weekly appointment book features a unique graphite, textured cover with contemporary design for a modern-day look. Special information pages offer plenty of space for note-taking and project management. Dated planning pages range 12 months of planning from January to December. Two-page-per-week spreads include ruled daily columns with a ruled space for priorities, Monday-through-Sunday scheduling, half-hourly appointment times from 8 AM to 5:30 PM on weekdays, ruled notes area, count of days/days remaining, and federal holidays in red. Tabbed two-page-per-month spreads feature unruled daily blocks, Sunday-through-Saturday scheduling, ruled column for priorities and notes, count of days/days remaining, federal holidays in red, and past and future months reference. 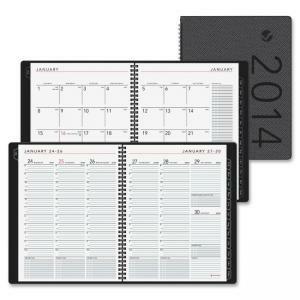 Wirebound appointment book also has a simulated leather cover and is nonrefillable.